PC Past President Mark Hamrick welcomed guests and a panel of journalists and historians led by James Thurber, director of the Center for Congressional & Presidential Studies at American University. Joining Thurber were Evan Thomas, whose book "Ike's Bluff" was recently released, Eisenhower biographer Jim Newton and Michael Birkner of Gettysburg College. Did Ike like the media? Or did he consider them a necessary nuisance? Did he use their reach and credibility to telegraph messages to other world leaders? 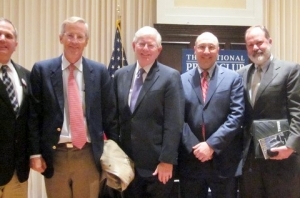 On the evening of Oct. 11, members of the National Press Club, joined by guests from the Kansas State Society, members of the Eisenhower Administration and Eisenhower buffs gathered to discuss how Dwight D. Eisenhower interacted with the media. The 1950s were a time of growth and change for the news media –- with television joining radio in bringing unprecedented immediacy to press coverage and with the White House press corps expanding into a 24/7 operation. Panelists agreed that in both his role as president and as a military leader, Eisenhower understood the value of using the media to inform and engage the public and garner support. The first president to hold televised press conferences, Eisenhower and his senior staff met with the media on a regular basis, often using them to send signals to other world leaders. It was  noted that while Eisenhower was under-appreciated by some notable media icons of the time, that history has shown that his low-key style belied a sharp understanding of the nation's challenges, as demonstrated in the eloquent style of many of his significant speeches on a wide range of issues. In a lively question and answer session, 60 highly engaged guests, including some veterans of the Eisenhower Administration, provided insight through their own experiences with the 34th president. The evening’s discussion included a footnote to the Press Club’s own history: President Eisenhower keynoted the National Press Club’s Silver Jubilee in January 1959. Following the program, guests were invited to view renderings of the proposed Eisenhower National Memorial, designed by world-renowned architect Frank Gehry, depicting Ike's roles as both President and Supreme Commander of the Allied Forces during World War II. The memorial to Eisenhower will be built in a park-like setting a few blocks from the U.S. Capitol on Independence Avenue, across from the National Air and Space Museum.